People walk around the Estação Mercado, a central transport hub in Porto Alegre, Brazil. Here lotações, or share-taxis, offer residents diverse transport options. Photo by Eduardo Zarate/Flickr. A sleek, air-conditioned vehicle picks you up at your front door. The seats recline for your comfort. You pull a shade across the window to block the sun’s glare while catching up on your favourite show, which you stream on your computer using the vehicle’s free WiFi. When you near your office, you tell the driver to drop you off outside the building. Something resembling this fantastically perfect commute does exist, but perhaps not where you might think. Porto Alegre, Brazil’s Lotação (translated as “capacity”) is a public mini-bus that costs more than a conventional public bus but less than a taxi. Lotações operate on strict street routes, but passengers can be picked up and dropped off almost anywhere. These upscale buses are not likely to solve each and every challenge for sustainable urban mobility, but they teach a critical lesson: the path to sustainable urban mobility is different for every city, and successful solutions will meet both the economic constraints of a city and the residents’ personal needs. These customized public buses work well in Brazil because they serve a particular market niche. Such market segmentation both reduces strain on the traffic network and raises funds for the city. Porto Alegre’s innovative mini-buses are a variation on the polyonymous share-taxis and other informal transport options that pervade the developing world. 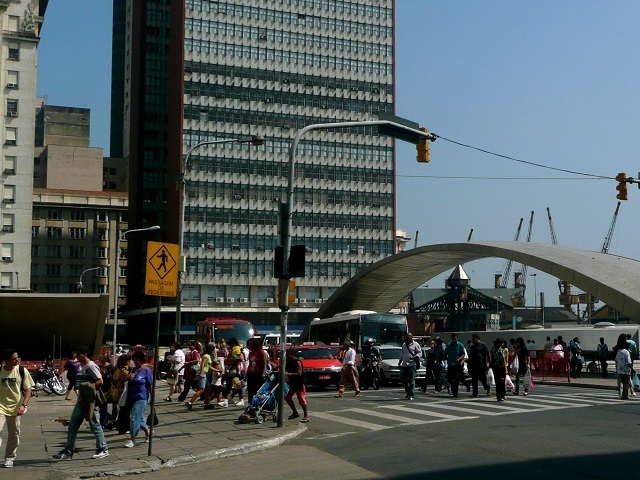 In Brazil, a post-WWII population boom created an increased demand for mass transport options. Taxis were fitted with an extra row for greater capacity, and termed taxi-lotação. A formalized version of the enlarged taxi was sanctioned by the Porto Alegre City Council in 1976. The word “taxi” was dropped from the name after the vehicles were upgraded to vans, allowing for more than twenty seats. Today, the 400 or so Lotação buses are integrated into Porto Alegre’s transit system and carry about 60,000 passengers per year. Porto Alegre’s upscale buses reinforce the idea that urban mobility solutions need to be created in response to local needs and sensibilities. While there are lessons to be learned from other countries and other cities, often it’s indigenous solutions that are the most transformative. Upgraded rickshaw fleets in Indian cities and the explosion of shared mobility solutions in North American and European cities, for example, reflect the evolution of local priorities, demands, and technologies. Conversely, not all innovative transport solutions work everywhere. Bike-sharing has been markedly unsuccessful in Australian cities (arguably because local laws require all riders to wear helmets), and there have been limitations to the application of bus rapid transit (BRT) systems in some developing countries. This is not to say that bike-sharing or BRT are bad ideas at heart, but that local nuances affect the on the ground impact of solutions that have proven successful elsewhere. The private sector is often the first to respond to local market conditions. Indian rickshaw drivers and American shared mobility providers like Uber are primarily private firms. Seeing the growth of the city’s enterprising Lotação industry, Porto Alegre officials had the foresight to formalize and integrate the shared taxis into the city’s transport network. As a result, the transport market maintains its market segmentation, providing a range of services for riders, but all services operate along coordinated routes. The future of urban transport depends on innovative solutions that work in local contexts. The Lotação model might not work everywhere, but local demands can inspire something equally effective. Cities should be attuned to these pioneering opportunities so that transport innovation can be scaled up and utilized for the benefit of all urban residents.